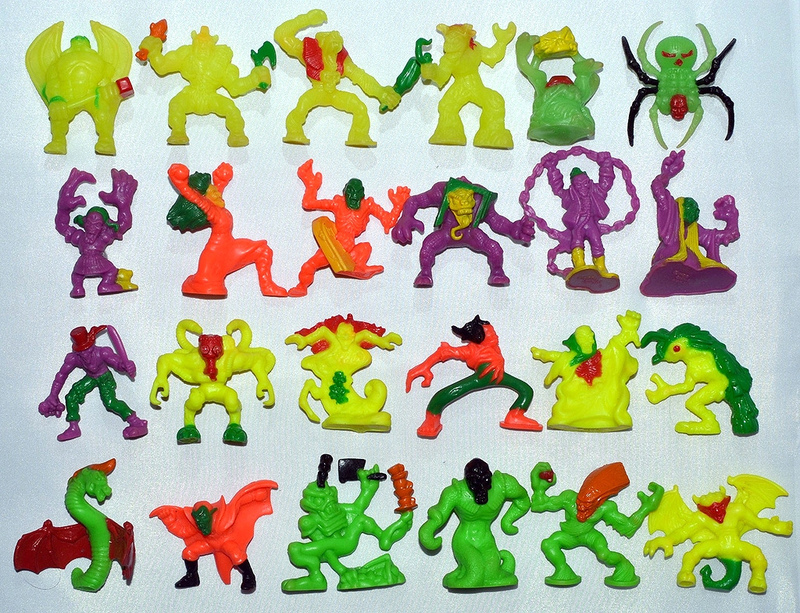 In 1992, Matchbox released the 4th series of Monster in My Pocket, the "Super Scary" set. To most kids who collected MIMP back in the day, it would have seemed like the third series, since the actual Series 3 just had a partial, limited, low-key release in the U.S. as Big Boy kids meal premiums and in Canada as cereal premiums. The Super Scaries seemed to come out of nowhere. Unlike Series 2, which I had known about as a kid but never actually was able to find in my area, the first time I became aware of Series 4 is when I saw it in Toys R Us. Being such a huge MIMP fan I had to have them, but I immediately noticed they looked different from previous series. 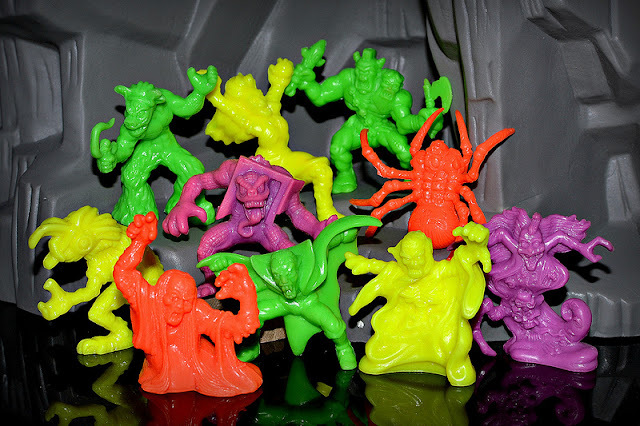 These monsters were a bit larger, had painted details and some of them glowed in the dark. Obviously Matchbox were trying new tricks in an attempt to keep MIMP marketable and make the line more exciting to kids. Unfortunately it didn't seem to work and the franchise sort of fizzled out after this, at least in the U.S. (in the U.K, where MIMP was always more popular, it continued for a few more offshoot series like Wrestlers, Aliens and Super Creepies). Here they are - the wildest, scariest, most outrageous collection of real monsters ever assembled! And every single one of them is worth at least 50 points, with 6 rare glow-in-the-dark 100 pt. value monsters included, more than even the highest value monsters in either series 1 or 2. You know why? Because every one of these monsters is a big, bad, super scary dude. Put these guys in your pocket - and scare the pants off your friends! 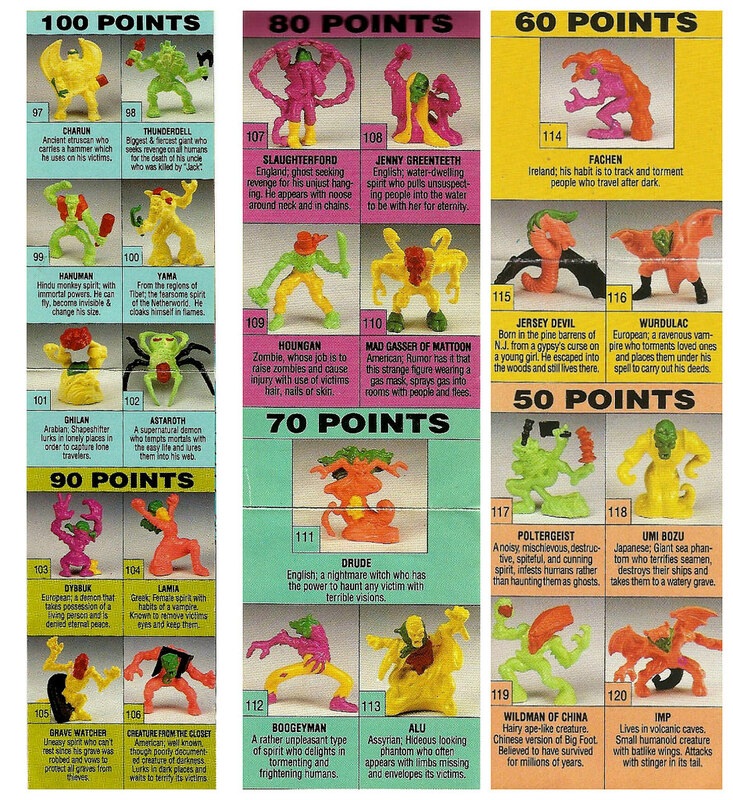 For its general release, most of the monsters came in 2 different color schemes, with the base rubber colors being neon green, neon yellow, neon red and neon purple, plus glow yellow and glow green for the 100-point monsters. Each figure had different colored painted details depending on its base rubber color. I always thought the Super Scary set contained some really cool sculpts, like the 100-pointers, Jenny Greenteeth and Creature From the Closet, to name a few, but I've found the random painted details to look kind of odd--even as a kid. Matchbox was trying to make them look cooler, but to me it sort of had the opposite effect. And here's a comparison shot of some of the basic painted versions with their mono counterparts. Which ones do you prefer? Overall, Series 4 was a fun addition to the MIMP line, but to me it doesn't match the greatness of Series 1-3. It's too bad all 24 figures weren't made in monochromatic colors, and in a size that matched the first few series. If that had been the case, I think they'd be considered much more essential among MIMP collectors. What do you think? Are you a fan of the Super Scaries? I believe you're right that the unpainted premiums were only available in the UK. They came in cereal boxes (I can't recall which brand, although Weetos and Kellogg's Frosties were usually the MIMP giveaways) as part of a hotch-potch collection that included series 1 and 2 figures. Possibly there were other premium releases as well that I'm not aware of. Much prefer the unpainted sculpts. 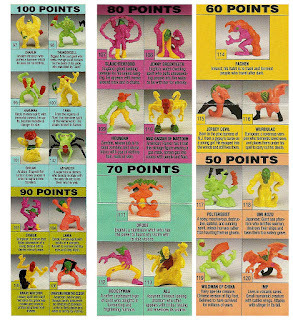 I remember being very excited by the Super Scaries at the time, but even then the sudden hike in points value bothered me. By the time series 7 was out (the Space Aliens) they'd reached ludicrous levels, up to 500 points. Also, were you aware that they were rereleased in the UK a year or so later, with a new collector's leaflet? Hanuman was deleted and some of the names were changed. I think I might have heard about Hanuman getting removed, but I didn't know they were re-released later. Would you say Series 4 was popular in the UK? This is from childhood recollection, of course, but I remember series 4 being popular here. Maybe not as popular as the first two, but they were easy to find and still aren't hard to track down. Certainly popular enough to ensure another three series of the original run. In the UK, it was advertised as Super Scary Series Three - I don't think any of the actual series three figures were released here at all. Hanuman and Yama caused problems for exactly the same reason Ganesh caused problems in series two. Kind of amazing they didn't learn from that. Anyway, very shortly after the series was released, Hanuman was deleted. Later releases (only months later from what I remember) had no Hanuman - just a gap in the collectors leaflet where it belonged. Yama seemed to be acceptable, I suppose because Yama is a demon in Hindu mythology rather than an actual god, but they still changed the name to Fire Demon. For whatever reason, they changed a bunch of the other names, and these ended up being the measier to find versions. I think the new names were the only ones used on the Battle Cards, but I may be wrong. Cool, thanks for that info. I wonder why they decided to change all those other names. I guess just being super cautious? Also, I should have grown up in the UK--I couldn't find any other kids here who were into MIMP, haha. Interesting take on the Jersey Devil.I live a few minutes away from Leed's Point, birthplace of the Jersey Devil,and Ive seen many artist's conceptions.Usually they combine human traits with those of deer, owl, or dog, then add Bat wings.This version looks like a Dragon or Wyvern.Fun to think this critter could show up in my back yard someday! Yeah, MIMP had some unusual takes on some of the monsters. Some were obviously copied from classic depictions, but others they really got creative with. I always disliked the painted ones (which I'd say are the hardest to find in UK?) only because we'd got used to the unpainted ones first! Having a toy line with some mono- and some polychrome is just annoying!! Yeah, in my opinion mini figures almost always look better monochromatic! Nope, the painted ones were the standard in the UK. I never had any unpainted ones during the time they were actually out, it's only in the last few years I've got any of those. Marvellous things... Before the Internet was a thing, Super Scary WAS series 3 to most of us in the UK. Also, I never knew about the Hanuman figure until the Internet - all I knew was that one Xmas, I got the two Super Scary 12-packs for the full set, yet Dybbuk was in both packs. All these years I thought they were just being lazy! MIMP carried on for MUCH longer here, as you know - after Super Scary we had Super Creepy, then Dinosaurs (and an extra mini series of those too), then Space Aliens, Wrestlers, Ninja Warriors and Sport Stars. Happy days! I wonder what caused the difference in popularity between countries...I couldn't find one other kid in my neighborhood who liked MIMP, and Series 2 never even got released in my area. I'm sure I would have collected the later series too, had they been released here. I much prefer the mono versions. Since starting to rebuild my collection (stupid teenage me selling all my cool toys) I've only managed to get one mono one and a handful of the painted ones. I love me some MIMP! Your story is the same as mine, I eagerly awaited MIMP Series II, never saw it despite plenty of advertising for it, and then one day these Super Scaries were there at my Kiddie City. They were only there in two huge sets, giving you the entire series. Seems like certain areas of the country just never got S2. Perhaps where S1 wasn't selling that well. 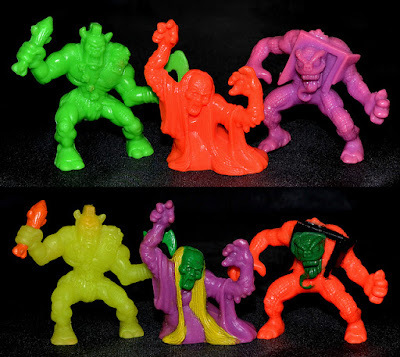 It was a huge disappointment as a kid obsessed with these things, and it's not like you could get them online back then. I like the Super Scaries, because they remind me of good times. Memories of me watching MacGyver, eating pop corn and having a blast, because christmas was around the corner. That's when I went to a supermarket here in Germany and found both of the pyramids there. I was shocked, because I'd never seen these new Monster in My Pockets. Since I had some money in my pocket, I bought them both and it was great. Loved The Mad Gasser and Charun... and still I do understand why people love series 1 and 2 more, guess I do as well, I still think these are underrated and cool as well. I know what you mean, nostalgia is a big part of toy collecting. And I think the Super Scaries are pretty cool, just wish they kept them all unpainted.